I started by embossing my panel with one of the circle framelits - oh yes, they're not just for cutting you know! (This is the sandwich I use for embossing with framelits in my Big Shot (from bottom to top): multipurpose platform closed, crease pad, my card panel, the framelit blade facing up, a scrap piece of card stock, cutting pad.) The designer paper was cut with the same framelit and I sliced the top off and glued it onto the embossed circle before stamping my penny farthing. The penny farthing was stamped again onto scrap card stock so I could make separate wheels. I used various circle framelits and punches for this (I've listed which ones underneath the product list for anyone that's interested.) The wheels were glued over the stamped ones and decorated with Basic Grey candy dots. I've had circles on the brain ever since I saw Less is More's Round and Round challenge this week but I shall also link this card up with Make My Monday which is looking for Male cards, Addicted to CAS where Wheels is the theme, and Addicted to Stamps and More where the lovely ladies want to see CAS cards. The large wheel cuts out with the third smallest circle framelit and the small wheel with the 3/4" circle punch. To make the large tyre I cut a circle into Basic Grey card stock with the 1 3/8" circle punch and then cut round it with the third smallest circle framelit; to make the small tyre I cut a circle into Basic Grey card stock with the smallest circle framelit, then cut round it with the 3/4" circle punch. Returning home with my daughter in the car last weekend, we stopped at the lights and watched while a young lad zoomed over the crossing on his scooter. At the other side, to our astonishment, he leapt off the scooter and twisted it around his head with a practised flick of his wrist. After this move, he peered anxiously into our car to make sure we were impressed, only to find my daughter convulsed with laughter in the passenger seat. Poor chap - I hope he managed to convince himself that she just wasn't worth it! This is lovely Vicky, great dimension on the penny farthing! Oh Vicky, once again you`ve come up with a design that made me gasp ( and I don`t often gasp y`know). Fabulous! Love it to bits. This is wonderful, love the embossing and the bike. Ingenious. Love how you made the penny farthing dimensional. Thanks for the tips on making the tires and embossing the circle on the card. What a gorgeous card vicky and clever use of the framelets. 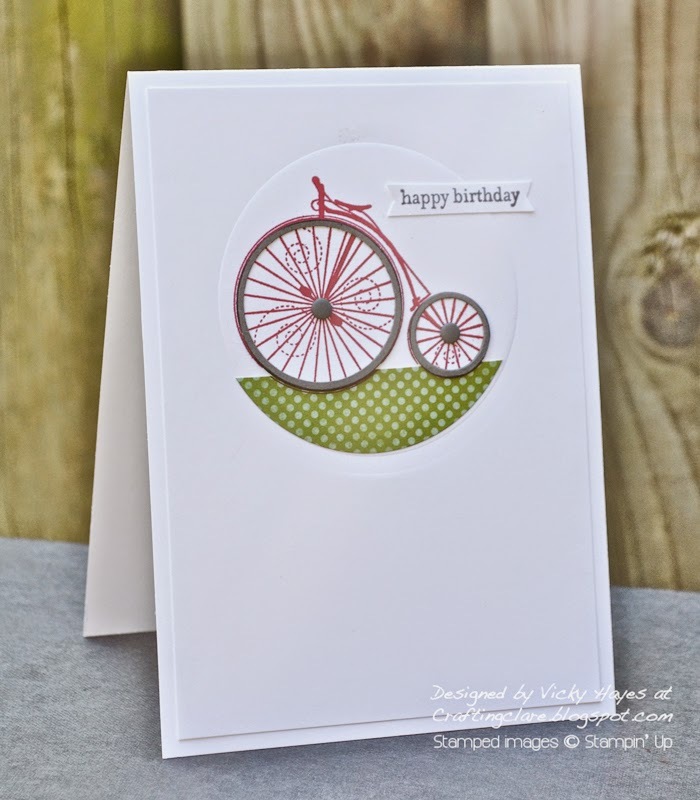 That penny farthing stamp is super and looks gorgeous with the colors you have used. Thanks so much for joining us at ATCAS with this super card. A fabulous CAS design Vicky. Great use of the circle dies - the wheels are awesome! This is genius Vicky! I love the tyres and the embossed frame! So clever Vicky! I have always loved that stamp set and this the the most beautiful use of it that I have seen! Simply gorgeous! This is another fabulous card Vicky. It's SO attractive! Love that embossed circle and the partial of DSP! And the bicycle is amazing with all the dimension! A real eyecatcher in the gallery over at ATSAM. Congrats on your well deserved win at ATCAS, Vicky! Your card is really fabulous!!! Oh my gosh this is GORGEOUS!! So beautiful!! Congrats are most definitely in order! So awesome - and I truly can feel the motion you've created with the background stamp. How fun...My brother won a Kennedy silver half dollar when he rode his tricycle in a parade back in 1964...I think this will be his birthday card this year...50 years later...THANKS for sharing Vicky!